1. First, mount the LoPro Phone Mount. 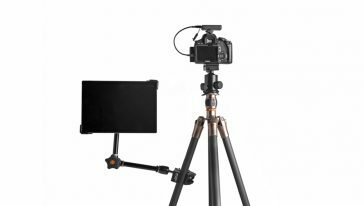 The top, back, and bottom of the Phone Mount have a standard 1/4″-20 mount receptor for quick and easy attachment to any 1/4”-20 supports such as tripods, articulating arms and EasyGrip Clamps. 2. Next, mount your device. Expand the LoPro to fit your phone, and place the phone or accessory inside, making sure that it is securely held by the cushioned, non-skid pads on the interior side of the clip. 3. Finally, ensure that the LoPro Phone Mount is securely attached to the 1/4”-20 thread and that your smartphone or device is snugly held by the LoPro. 1. To clean your LoPro Phone Mount use a damp towel or soft cloth. DO NOT use harsh chemicals or abrasive cleaners. 3. The LoPro Phone Mount is spring-loaded to expand up to 3.35” (85mm) to accommodate most phones currently on the market.